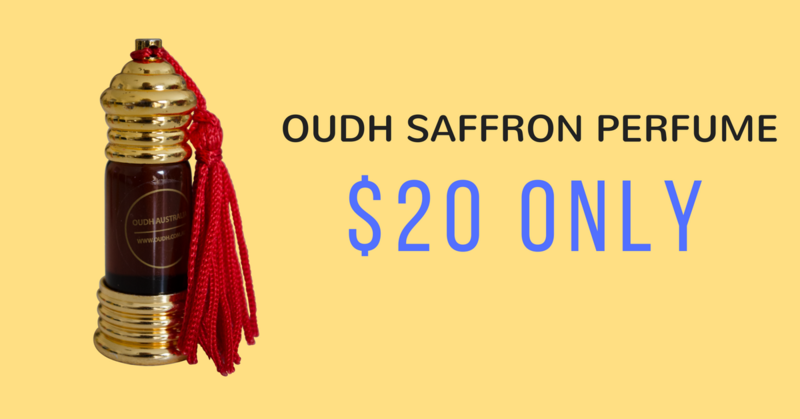 Oudh Australia’s Oudh Saffron perfume bring to life the beautiful, ancient secrets of luxury fragrances made using the finest organic ingredients sourced from around the world. Oudh saffron is an easy to use perfume as you can apply it directly on your skin at pulse points (neck, inside wrists, behind ears). Perfect for all occasions, ‘Oudh Saffron’ is one of our more dominant fragrance. It’s thick, it’s dark and it’s strong. The concept of 100% organic and toxin-free perfume is rooted in our ancient history and we, at Oudh Australia, always ensure that our perfumes & fragrances are totally free of alcohol, harsh chemicals and cruelty-free. Oudh saffron is 100% Original fragrance encased in the most elegant packaging, worthy of being flaunted. Long lasting and free of alcohol for men & women; Oudh Saffron’s distinct aroma creates an aura that is as mystical as it is intriguing. As a matter of fact, Oudh Saffron perfume is custom-made for fitness enthusiasts. If you are an active outdoor person, then Oudh Saffron is the perfect fragrance for you without a doubt. If you work out in gym, then just put a single drop on your gym towel and every time you wipe your face you will get a magnificent boost of energy and relaxation through the dutiful fragrance of ‘Oudh Saffron’. However, just be mindful that it may leave marks on a light color towel, and that’s because it’s dark and it’s thick. This product from Oudh Australia has aromatic fragrance which calm and relax the body. Wear this startling aroma of Oudh saffron with pride to leave a serene effect on yourself and those around you. Above all, we are so confident that if you buy Oudh Saffron from us and don’t like it just post it back to us and we will give you a full refund. Even Better, buy the twin pack of “Oudh Saffron” and “Oudh Musk” on our recommendation at much cheaper price and if you don’t like it, same rule, post it back to us and we will refund your money – NO QUESTIONS ASKED. All things considered, hands down, eyes closed, buy Oudh Saffron.